This article is dedicated to all of those who were taught the world would end in 2012. In his book The Bridegroom Was A Long Time In Coming, And They All Fell Asleep, Ahn Sahng-Hong, the man the World Mission Society Church of God (WMSCOG) claims was the Second Coming of Jesus, predicted the end of the world in 2012. These writings are in line with others that have been removed from WMSCOG books. The Bible tells us that failed predictions are the sign of a false prophet (Deuteronomy 18:21-22) and besides Ahn Sahng-Hong contradicting Scripture in numerous places, his 2012 failed prediction is yet another very clear indication that he can not be Jesus. 모세가 두 번째 십계명을 받은 때로부터 성막을 건축하였으니 이예언의 실상은 예수께서 하늘 지성소에 두 번째 들어가시던 서기1844년 10월 22일, 즉 성력 7월 10일 대속죄일에 대한 예언입니다. They built the tabernacle when Moses received the Ten Commandments for the second time, as a prophetic foreshadow of Jesus entering the heavenly Most Holy for the second time on October 22, 1844, which is the Day of Atonement on the 10thday of the 7th month (referring to the Hebrew calendar). 모세가 두 번째 십계명을 받은 것은 예수님께서 두 번째 하늘 지성소에 들어가시는 것의 예언이 됩니다. Moses receiving the Ten Commandments for the second time is prophesying that Jesus will enter a second time into the heavenly Most Holy. 모세가 성력 7월 10일에 십계명을 받고 성막 건축하기 시작하여 다음해 정월 초일일에 성막 곧회막을 세우고 또 증거궤를 들여놓고 준공식을 거행하였습니다. Moses received the second Ten Commandments on the 10th day of the 7th month and began to build the tabernacle, and on the first day of the following year the ceremony was held for laying the ark of the testimony in the tabernacle. 십계명을 받은 다음 날부터 성막 건축 시작하여 168일만에 준공식을 거행하였으니 이 예언의 성취가 예수님께서 이루어지게 되었으니, 예수님께서도 서기 1844년 성력 7월 10일 대속죄일에 하늘 지성소에 들어가심으로 그 때부터 하늘 성전을 건축하기 시작하여 168일 즉 168년만에 준공식이 되는 것으로 보여주고 있습니다. Since the day that the Ten Commandments was received, it took 168 days to build the tabernacle and to hold the ceremony, and as the fulfillment of this prophecy, Jesus also went into the heavenly Most Holy on the 10th day of the 7th month in 1844 which is the Day of Atonement, and since then began to build the heavenly temple for 168 days namely 168 days until the ceremony. 예언성 1일을 1년으로(겔4장6절, 민14장34절) 해석하게 됩니다. The prophecy is to be interpreted as 1 day to 1 year (Ezekiel 4:6; Numbers 14:34). 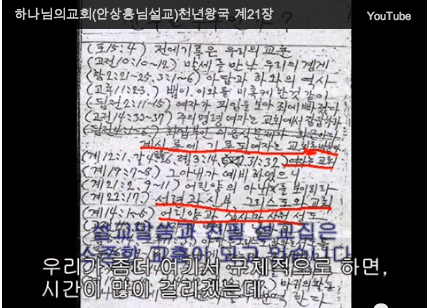 그런고로 예수님이 하늘 지성소에 들어가시던 1844년에서 168년을 합하면 서기 2012년이 마지막 끝날이 되겠습니다. Therefore, adding 168 years to 1844 when Jesus entered the heavenly Most Holy, 2012 becomes the last day. 그리고 서기 1844년에 대한 문제는 전국에 계시는 성경학자들이 인정하는 안병한 저서 “성경보감” 315페이지에도 기록도어 있고 또 시조사 발행책 “각시대의 대쟁투 하권” 205페이지에도 자세히 기록되어 있습니다. 하신 그 말씀 중에도 분명히 정한 날짜가 있다는 것이 분명합니다. in this verse, it is certainly clear that the date is set. 그래서 그 사실을 해명하기 위하여 위에 기록한 첫 번째 것에 대한 모세의 행적과 그 예언 성취를 해명해 드렸습니다. So, as recorded above, first, the works of Moses and the fulfillment of the prophecies were explained. 이제는 그 다음 두 번째 것, 즉 “신랑이 더디 오므로” 하신 이문제를 해명해 드리겠습니다. 이 두 번째 것을 해명하기 전에 “하나님의 비밀과 생명수의 샘” 책 7-12페이지에 (’04년도 “하나님의 비밀과 생명수의 샘” 1-6페이지) 기록된 40년의 예언, 서기 1988년이 세상 끝이 될 것이다한 문제를 먼저 연구해 보시고 “신랑이 더디 오므로” 하신 그 말씀이 어느 날짜에서 더디 오신다 라고 하셨는지 연구해 보시기를 바랍니다. Before I explain the second issue, analyze the prophecy of 40 years and the year 1988 as the last day as recorded in “The mystery of God and the fountain of life” book on pages 7-12 (Pages 1-6 of the 2004 edition of “The mystery of God and the fountain of life”) also study the verse, “the bridegroom was a long time in coming” and the date he will be delayed . 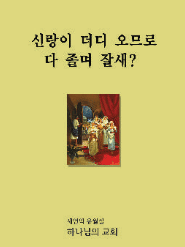 성경에 예언하신 말씀이 다 정확하게 맞지 않으면 안됩니다. All of the prophecies in the Bible must fit correctly. (마24장35절) “천지는 없어지겠으나 내 말은 없어지지 아니하리라” 하셨습니다. 그러면 “허나님의 비밀과 생명수의 샘” 책 7-12페이 지에 (’04년도 “하나님의 비밀과 생명수의 샘” 1-6페이지) 기록한 말씀을 먼저 읽어 보도록 하십시다. (Matthew 24:35) “Heaven and earth will pass away, but my words will never pass away.” Let’s first read what’s written on pages 7-12 of “The mystery of God and the fountain of life” (pages 1-6 of the 2004 edition of “The mystery of God and the fountain of life”). Restoration of Jerusalem and the prophesy of 40 years. Despite multiple failed end of the word predictions, some members of the WMSCOG hold fast to their beliefs. Other members have awoken and realized that these failed predictions and any denials that they were ever made, are indicative of errors that exist within the doctrine, and have decided to free themselves of the spiritual captivity they once experienced and return to Jesus Christ. Have something to say? Join the discussion in the forum. [CASE CLOSED] As if it weren’t already. They need to speed up the phase out. Thanks yes this is what we were taught. yup this is the exact teaching the pastor gave. “This is the year of prophecy” Really? what happen with this web page few days ago this examining wave page were not working properly. I had a bad feeling that WMSCOG gave enough money to close this website. this examining site is providing many good information so this thing should not be happened. keep up to date. The website underwent a DDOS attack. hypocrites, you all still do not know.everything is happening like at the time of Jesus. Judgement is delayed because of you all.. poisoning the mind of all people..
Judgement is being delayed? How did we supposedly FORCE God to delay His judgement? This is NOT even possible! Even more, wouldn’t the poisoning of peoples minds by all of us outsiders make God want to judge us for our wrongdoings? ggegegegege please wake up and look at what you are being told. Things don’t add up! No ggegegegege, everything is NOT happening like at the time of Jesus. For one major thing, Jesus performed miracles. Ahnsahnghong didn’t, and the “Mother” doesn’t either. And those who follow the Bible don’t just follow anyone that others say is Jesus. The Bible warned us about that. It says there will be many false prophets. Unfortunately, the Wms members don’t know they are being deceived by false prophets. And by Koreans who want their money and laugh at them for being so easily fooled into giving it all. I wish it wasn’t so, but it is. Those that have been led astray by this Satanic cult choose to be led away. God does not put anyone in hell, people choose to walk into it. I know someone who has been sucked into this blasphemous cult. They refuse to listen to reason, refuse to investigate the facts, refuse to take the twisted doctrines of his cults and test in the light of truth. They prefer to remain in darkness as the pagan idol worshippers did. Because the bliss they get from this place is the trade they made with Satan. The feeling of being on the right path while being fooled that everyone is on the wrong path makes them feel special. They feel unique and chosen. Deaf, dumb, and blind they refuse to follow God’s law directing us to always seek knowledge and question those that make divine claims. They are the blind being led by the blind and lead others that choose to be blind. Despite how much logic and reason and evidence to present to them, it usually falls on deaf ears. When they choose to walk away from God, God only increases their distance. To them truth is not important, facts are not important. They accept what they are spoon fed blindly, refusing to question the false gods they worship. They believe a living woman in Korea is God because of her ” association ” with Mr. Ahnsahnghong – a false prophet who has been cannonized to the status of God. Ignorantly they bow down and worship this dead man and his surviving wife insulting God by lowering the creator of the universe in which we are speck within a speck within an ocean of smaller specks. God’s creation and eternal presence is beyond the human beings comphrehension. He is omnipotent, omniscient, and omnipresent. Yet these idol worshippers reduce this greatness to an imperfect mortal man who spend the first 35 years as a Buddhist. A man that made false predictions and contrived lies. To them God now has flaws. Even more blasphemy, they have created a god out of his divorced wife who lives in a palace and has another occupation as the chairman of a “charity” in which you go to the website asks you to donate money!!! If she were God she would not need to post a website to beg for money! Do not feel sorry for the fools that choose this path. They do it because they decide. They are presented with the truth yet discard to walk with Satan.